Why you don't require cleaning apps to boost device performance? Do you have Clean Master app installed? Then you would probably want to disable annoying ads shown on charging screen. 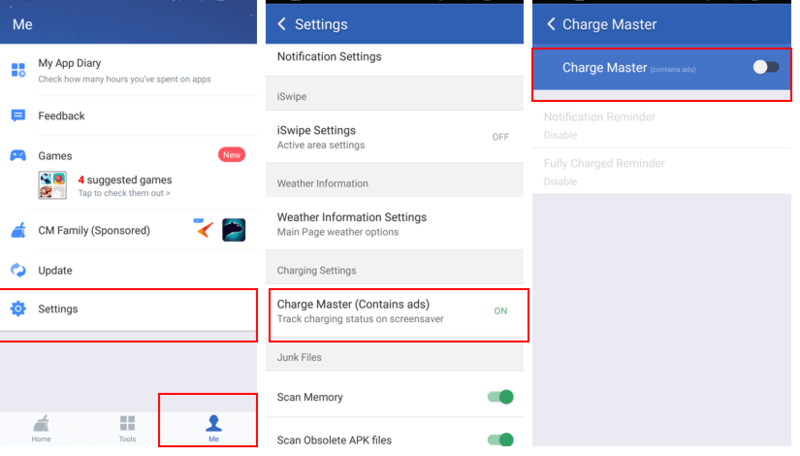 Well, this tutorial will explain how to block Clean Master ads on Android charging screen and also explains why you don’t require any cleaning app. To start with lets block Ads shown by Clean Master on charging screen. To do that, launch Clean Master app and tap Me (located at the bottom of the screen) > Settings > Charge Master (Contains ads) and disable Charge Master. Not using Clean Master app and still see Ads on charging screen? Then you would have installed one of the below app that might be displaying advertisements on charging screen & lock screen. Why you don’t require cleaning apps to boost device performance? Do you know how many are using Clean master app on Android? Well, I just picked my dad’s mobile and he has one installed. I did saw one on my mom’s mobile as well. To my surprise, they started using Android phones very recently and it’s strange they already have cleaning app installed on their device. How did they get to know about this app? Probably, they would have clicked on some advertisement and ended up installing the app? May be. Well, we are not here to discuss how my mom and dad installed Clean Master on their Android phone, but I just want to convey that there are many out there using such cleaning apps without knowing one thing – “They are not required”. Really, the reason is here. Most of the cleaning apps promises to boost device performance by cleaning up your phone. Of course, it’s true that the deleted apps leave some unnecessary data and cleaning those will really improve performance. But do you really need an app to do that for you? 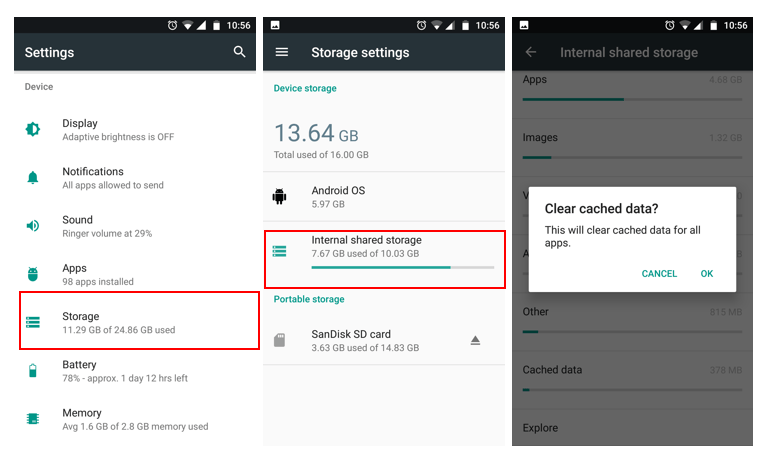 All you need to do is, go to Settings > Storage > (Internal shared storage) > Cached data and tap Ok (when Clear cached data box is prompted). 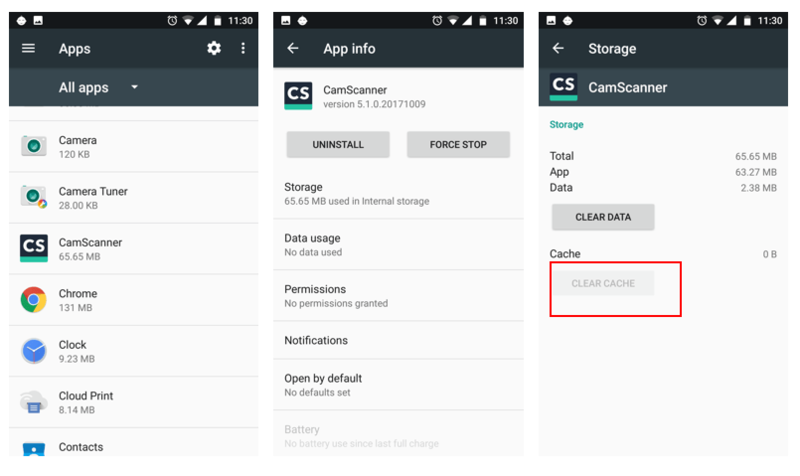 You can also clear the cache of a particular application by going to Settings > Apps and tap on the app you would like to clear the cache and tap “CLEAR CACHE“. Now tell me do you really need an app to clear the cache? Apps like Clean Master consumes lot of battery power and have plenty of in-app advertisements (sometimes display ads on Lock screen & Charging screen) which could take a toll on your mobile bill. How to View Page Source on Mobile browsers? Lockscreen Ads on Android? Opera Mini, the culprit!